Access to the Wedding Couple Attire costume. It takes two to make a wedding! Celebrate the romance and pageantry of Gwen and Keiran's wedding. 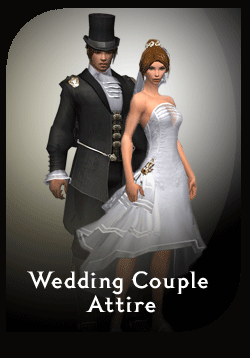 The Wedding Couple Attire grants your account access to two formal outfits. Your female characters will be dressed to the nines in Gwen's bridal gown, a gorgeous strapless wedding dress with matching headpiece. Male characters will be outfitted with Keiran's tuxedo, an elegant tux with tails and a matching top hat. This item fits into the costume slot on your character panel and can be worn over existing armor. How to redeem - Once the Wedding Attire serial key is applied to your account, speak with the [Costume Maker] located in Lion's Arch, Shing Jea Monastery, Kamadan, and the Great Temple of Balthazar. This NPC will provide you with your costume. Once purchased, any character on your account can speak to the [Costume Maker] to receive their own Wedding Couple Attire.